It’s been a while since the jailbreak for iPhone 4 has been out. But, today I updated my iPhone 4 firmware to 4.2.1 and decided to jailbreak it. I was searching for some jailbreak tutorials for jailbreaking iphone 4 with OS 4.2.1 on Windows but I couldn’t find straight forward ones. I just jailbroke mine and decided to write a short and simple tutorial for our readers just like the previous one for unlocking iPhone 2G with 3.1.3 firmware. Firstly, update your iPhone 4 OS to OS 4.1.2. You can do this by launching iTunes and clicking directly on the update button or you can download the firmware from above and hold the shift key and then browse the downloaded firmware and select it. Download the Greenpois0n tool and extract its contents to a separate folder. 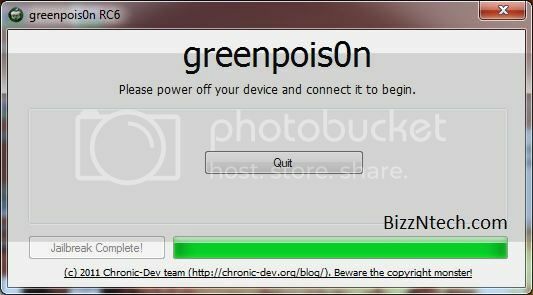 Double click on the greenpois0n tool to launch it. Turn off your iPhone 4 (Don’t connect the phone to the computer yet). Now, you need to be quick on this step as the phone needs to enter DFU mode. Click on the ‘Prepare to Jailbreak (DFU)’ button in Greenpois0n. Once the phone is properly turned off hold the power/ sleep button and the home button simultaneously with one hand and immediately connect the USB cable. Hold both of these buttons for 10 seconds and then release the Power button but hold the Home button. The phone will enter into DFU mode. The computer will install the necessary drivers. Now, you need to click on ‘Jailbreak’ in Greenpois0n. Wait for the Jailbreak to complete on your phone. Once it’s done the phone will turn off. Click on Quit in Greenpois0n and disconnect the phone. Start your phone and on the home screen you should see the option Loader. Click on it and install Cydia. If you don’t see Loader on it then you have not jailbroken your iPhone 4. Repeat the process again if you don’t see it.